Bryce Canyon is located in South-Central Utah. Operating Hours In Bryce Canyon? The park is open 24 hours per day throughout the year. There may be temporary road closures during and shortly after winter snow storms until plowing is completed and conditions are safe for visitor traffic. Road maintenance may require brief closures of individual areas at other times. The park receives close to 1.75 million visitors annually. Visitation peaks from June through September and is at its lowest in December, January and February. To Park: Regular commercial flights serve Cedar City (87 miles), St George (150 miles) and Salt Lake City (270 miles), Utah, as well as Las Vegas, Nevada (270 miles). Bryce Canyon Airport (4 miles), operated by Garfield County, has commercial flights from Las Vegas. Phone 435/834-5239 for current carriers and schedules. Private planes are welcome at this uncontrolled airport: Altitude: 7,586 feet; Runway Length: 7,400 feet; Runway Width: 75 feet. A shuttle service is available from the airport to local motels and recreational opportunities. Private vehicle rentals and bus tours originate outside the park. In spring and summer, concession-operated horseback tours are offered in the park. Biking is permitted on paved roads only; there are no bike lanes. Bikes are not allowed on park trails (see section on adjacent attractions). The Bryce Canyon Shuttle System: A FREE shuttle system enables visitors to enjoy the park and its natural and cultural beauty without the hassles of traffic. It also relieves some pressing natural resource protection concerns. It reduces the expenditure of tax dollars toward road maintenance and provides for better backcountry access. Visitors may park their vehicles at the Shuttle Staging Area (near Ruby’s Inn) or at Ruby’s Campground. Visitors can then board the shuttle from one of the stops listed below. From the east, travel west on Utah 12 to the intersection of Utah 63. Turn south (left) to reach the park entrance. Commercial tours are charged according to seating capacity as follows: $25 plus $5 per passenger for 1-6 seats; $50 for 7-15 seats; $60 for 16-25 seats; and $150 for 26 or more seats. ($50 annual fee) ($10 one time fee) Passports are available at the park Entrance Station and are honored for occupants of noncommercial vehicles. Golden Access Passports are issued at the park visitor center. Visitor Center/Exhibits: The park visitor center is open year round except Thanksgiving Day, December 25, and January 1. A ten-minute slide program, exhibits, restrooms, information, and backcountry permits are available here. In addition, maps and other publications are available for purchase through Bryce Canyon Natural History Association. Trails, Roads: The 18-mile main park road winds along the edge of the plateau, terminating at the south end of the park. Return to the entrance via the same road. Spur roads and pullouts offer opportunities for viewing and trailhead parking. Park speed limits range from 25 to 35 mph and are strictly enforced. In summer, parking at most viewpoints is extremely congested. Your best chance of finding a parking space at Sunrise, Sunset, Inspiration, Bryce, and Paria Viewpoints is before 10:00 a.m. and after 5:00 p.m.
Because all of Bryce Canyon’s viewpoints are east of the main park road, we recommend that you drive the 18-mile road to the southern end of the park, start with Rainbow Point, then stop at the remaining viewpoints on your way back to the park entrance. This will help you to avoid making left turns in front of oncoming traffic. Due to steep grades and limited parking, trailers are not allowed beyond Sunset Campground. Campers should leave trailers at their campsite. Day visitors should leave trailers at their overnight campground, at Ruby’s Inn free shuttle parking area just outside the park, at the park visitor center or at the trailer turn-around south of Sunset Campground. No vehicles over 25 feet in length are allowed at Paria View where the parking area is too small for large vehicles to turn around. Marked bus parking spaces are available at all parking lots which can accommodate buses. Bus engines should be turned off while parked. Motorhomes and trailers are not permitted in spaces designated for buses. Park rangers and volunteers conduct interpretive activities, including hikes, walks, geology talks and evening slide programs from late spring through early fall. Check at the park visitor center or Bryce Canyon Lodge for daily schedules. The Junior Ranger Program offers children ages 12 and under the opportunity to learn more about the park. Although the program is designed as an independent learning experience in an effort to accommodate individual family schedules, one important requirement is that the kids attend a ranger-guided activity. Recommended minimum time needed for completion of the program is approximately one full day. When kids fulfill their requirements, they can bring their completed booklets to the park visitor center and receive a Junior Ranger certificate. In addition, a special patch is available for $1. Each year at Bryce Canyon, volunteers donate more than 10,000 hours of service–over 10% of the park’s workforce. VIPs help staff information desks, serve as campground hosts, patrol trails, build fences, work with computers, conduct wildlife surveys, take photographs, and more. Currently the park is seeking volunteer applications for a winter/spring Museum Tech position. Call 435/834-4412 or visit the Volunteers In Parks Job Opportunities page of the NPS ParkNet website www.nps.gov/volunteer/jobs for a position description and on-line application. Amfac Parks and Resorts, Inc. operates a dining room in the Bryce Canyon Lodge, as well as a general store at Sunrise Point. Groceries, souvenirs, camping supplies, quick meals, restrooms, coin-operated showers and laundry facilities are available at the store from April through October. Private stores in the immediate area are open all year for food, supplies and other services. In spring, summer and fall, wranglers lead horseback rides into Bryce Amphitheater along a dedicated horse trail as well as on the Peekaboo Loop Trail. Write to Canyon Trail Rides, PO Box 128, Tropic, UT 84776, or call 435/679-8665 or 435/834-5500 for information and reservations. Most park facilities were constructed between 1930 and 1960. Some have been upgraded for accessibility, while others could be used with assistance. Because of the park’s natural terrain, only a half-mile section of Rim Trail between Sunset and Sunrise Points is wheelchair accessible. The one-mile Bristlecone Loop Trail at Rainbow Point has a hard surface and could be used with assistance, but several grades do not meet standards. Parking is marked at all overlooks and public facilities. Accessible campsites are available in Sunset Campground. Sight-seeing, hiking, camping, backpacking, photography, horseback riding, cross-country skiing, snow-shoeing, bird watching and other wildlife observation, star gazing, contemplation, relaxation. Plan to spend from one to several days depending on your personal interests. Because of the wide variety of recreational opportunities on nearby private, state and other federal lands, you can easily plan an extended vacation in this area. Stop at the Visitor Center for information, exhibits, and a ten-minute slide program. Publications and maps are available for purchase. Drive to Sunrise, Sunset, Inspiration and Bryce viewpoints. Hike a canyon trail or stroll along the rim. Check at the Visitor Center for current trail conditions. Lunch at one of the designated picnic areas. Drive to Rainbow Point (18 miles one way) and stop at the 13 viewpoints on your return trip. Check at the Visitor Center for current road conditions and closures. Attend a ranger-guided activity (available during summer months). Snowshoe or cross-country ski a designated trail on the plateau top. Rental equipment is available outside the park. Bryce Canyon is a magnificent place to visit and explore, there is no doubt. However its also very big with many different things to see! If you’d like a little help with this, would like to let someone else show you around, then here are a few guides to help you with that. Everything from scenic tours, to ATV/Jeep and of course Horseback tours. These guides are people who have lived and worked in and around Bryce Canyon and have detailed knowledge of it. Check out the listed guides below. Anyone will be sure to give you a great tour. Bryce Canyon National park, and the outlying areas. These over looks are a must see for everyone and the hidden gems that most people miss out on! Most of these not high trafficked spots are on moderately rough dirt roads and weather can turn them into 4X4 only. This is truly the best way to see this wonder of the world. If you brought a 4X4 to the Bryce area or are looking for one to rent or even a tour it is well worth it. With all of the endless amounts of road systems and trails through the Paunsuagunt Plateau there is something for everyone. There are countless overlooks that you can only get to with a four wheel drive! If you are looking for a great afternoon drive Daves Hollow behind the town of Bryce is a great option for you. If you are looking for a day trip or place to have a great picnic the trail system just west of Tropic Reservoir is an amazing choice. If you feel that a guided tour is best for you and your group please contact any of the local guides and tour companies! Connecting ATV trails start right outside the guest rooms and campground sites, and access trails in the National Forest. It’s said that a picture is worth a thousand words, but experiencing these locations with your own eyes first hand for yourself will definitely leave you speechless. Zion is home to breathtaking scenery and some of the most rugged, mountainous terrain in the west. 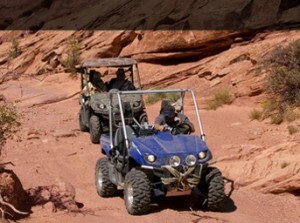 While ATV (all-terrain vehicle/4-wheeler) riding is not allowed within the Park, there are thousands of acres of private property located on high plateaus overlooking the Park’s famous canyons.